Happy Pancake Day! If you're having pancakes for dinner tonight and fancy trying something different, why not make your pancakes Bulgaria style? 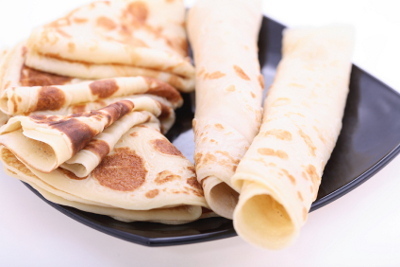 Palachinki (ÐŸÐ°Ð»Ð°Ñ‡Ð¸Ð½ÐºÐ¸) is a popular Bulgarian style pancake and by following our easy recipe found below you can make this year's Pancake Day one to remember! Put eggs, flour, sugar, salt, vanilla, milk & water in a blender. Blend until the mixture is nice and consistent with no more chunks of flour left. Put very little olive oil in a pan and heat on med/high setting. Then gently add 2/3 tablespoons of the batter and swirl the bottom of the pan while adding in order for the batter to be evenly distributed. Cook on med/high heat for approx 1 min then flip the pancake and cook for another minute. Serve with your favourite jam, honey or whatever else you like on your pancake.